Interesting things can happen as I found out the first time I climbed aboard a camel or stepped onto the back of an elephant. For most of us, our riding experiences outside of pure horsemanship tend to be with animals closely related to horses such as mules and donkeys. This experience too is not to be taken lightly as the anatomy and attitude of a mule or donkey is different from that of a horse. As horsemen, especially experienced horsemen, our ingrained muscle-memory instincts for the standard equine can come as a disadvantage when we’re confronted with an animal that is clearly not a horse. Once, while visiting the workshop of bit and spur maker Mark Dahl of Deeth, Nevada. My gaze fell upon a magnificent Longhorn skull mounted on the back wall. “He was a friend,” Mark chimed in as he picked up on my wide-eyed stare. “I raised him myself, taught him to ride and drive too. He was a heck of a good jumper! 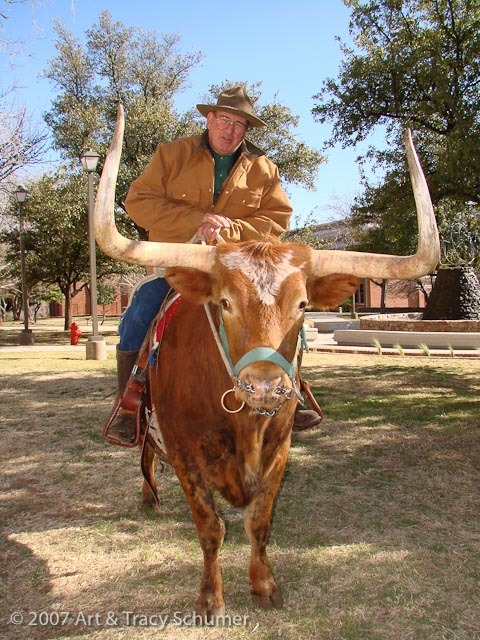 I could ride him right over a pasture fence.” Mark owned the Longhorn for fifteen years until the big steer succumbed to old age. He saved the skull as a memento. People often find it odd when they hear stories like this; why not just ride a horse? For Mark and many others like him, it’s a personal challenge- a test if you will; if a person can truly ride, then they should be able to ride anything. Alice Springs, Australia, also known as The Red Center, has a look and feel and smell very similar to the American South West. One of the differences is the fact that if you sign up for a “trail ride”, you’re likely mount will be a camel. A Camelus Dromedarius to be precise. Camel Trekking as the Aussies like to call it, is a popular activity and a fascinating experience for horsemen. Camels are not native to Australia, they were imported to the land down-under during the nineteenth century to cary supplies to construct the first north/south transcontinental railroad line. The camel’s Afghan handlers were famous for their expertise with these lanky desert critters. The railroad line they helped to construct still bears the camel master’s name and the logo includes an image of a camel rider; it’s called The Ghan. After the railway was completed, the Afghan workers were ordered to shoot their camels- they refused and instead turned their trusted mounts loose in the desert. As a result, Australia today has a large thriving population of top quality wild camel stock roaming the outback. They’re looked upon by the Australians in much the same way as Mustangs are in the American West- a politically charged, love/hate relationship. When I looked over my first camel I must say, many of those same mixed feelings ran through my head too! Suddenly, the camel began to rise from the ground. They get up using their rear legs first which will pitch an unweary rider right off the front of the animal catapult style if they’re not ready. The motion is quite sharp and quick- a bit like a bar room mechanical bucking bull set on low. Once the rear legs are up then come the front- lean forward at this point or you’ll be looking for the closest chiropractor when the ride is over. The sensation, the feel of the animal, was unexpectedly foreign from the very beginning, it was like I’d never ridden before and that can be quite disturbing- not to mention downright embarrassing for experienced horsemen. There’s certainly no getting any collection on this guy! Forget about bending at the pole or bending at all really. What we think of as a “soft feel” doesn’t apply here as the anatomy of the camel is so completely different. There’s generally no bridle but a lead halter is common. Camels are typically guided by their riders using a long string attached to a nose stud or “peg” called a Kraal which is traditionally carved from wood or camel bone. It was still dark when the last of our group mounted up successfully and we began our trek out into the pre-dawn desert. The overwhelming silence is what struck me first. The soft padded toes of the camel make almost no sound at all. No hard shod hooves hitting the ground, no snorts or whinnies- only the occasional deep baritone gurgling groan. Camels have been domesticated for riding and driving nearly as long as horses have. The first recorded military use of camels took place at the Battle of Thymbra in 547 BC. Cyrus The Great of Persia found himself woefully outnumbered by Croesus of Lydia. In desperation, he ordered his supply caravan of camels to lead his horse cavalry onto the battlefield in order to swell his numbers as much as possible. When Croesus’ calvary saw the line of camels coming at them, their horses uncontrollably scattered in terror, allowing Cyrus’ much smaller forces to carry the day. The largest camel calvary was the Ottoman Camel Corps which was active through the early twentieth century. The British Bikaner Camel Corps served in India during this same period. Although camels are formidable military mounts, their use in the western hemisphere was never successful. This was mainly due to a lack of experience. The US military haplessly experimented with using camels in their calvary during the mid nineteenth century. The escapade was even made into a movie titled; “Hawmps!”, released in 1976, it stared Slim Pickens. It was in the dune sea outside the Arab Emirate city of Dubai, that I saw first hand the close working partnership a person can have with their camels. We’d just completed a “Jeep tour”, what the locals call “dune bashing”. 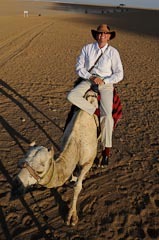 Looking back, I would have much rather spent the day riding a fine dromedary. Our tour was heading out of the desert when I spotted a long line of what appeared to be a loose band of nice looking camels, “Stop! Please, let’s get a look at them.” The driver politely obliged and even hopped out to speak with the lone camel herdsman on our behalf. 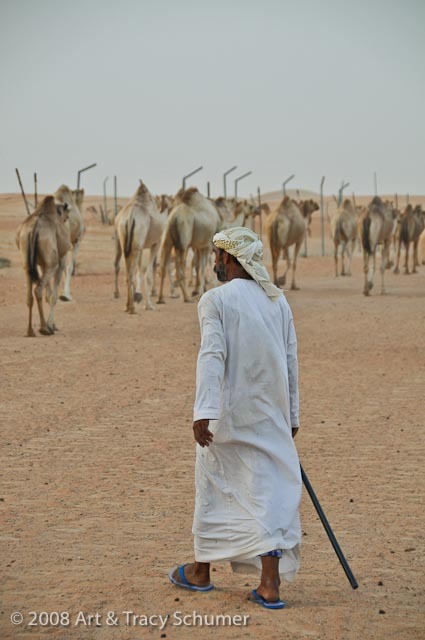 “He works for the Sultan of Dubai”, the driver explained, “These are the Sultan’s personal dairy camels and this man is bringing them back to their home after letting them graze for the day.” The herd numbered about eighty head, the Sultan’s camel master was simply taking his girls back to the barn for the night. As we chatted with the the man and took photos, untethered loose camels surrounded him. They affectionately nudged him, sniffed and nibbled at his robes. Dozens more camels were walking farther down the road, they must have sensed something amiss. After a few minutes, all eighty head had stopped on their own, with no visible signal from their caretaker. They waited, patiently looking back, watching their human leader’s body language. As our group got ready to go, the man waved goodbye and turned back to his camels, who then all simultaneously turned in unison and continued on. 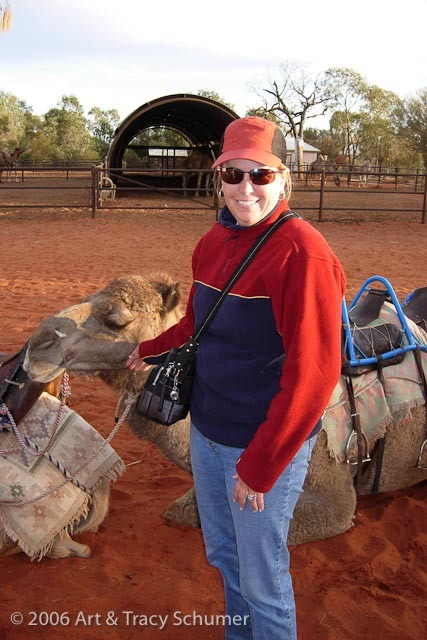 Years later, after having the opportunity to ride and study camels in other parts of the world; Morocco, India and Egypt come to mind, I can fully appreciate that first camel riding experience in Australia; a high quality outfit and good stock make the difference. Camels truly are ships of the desert. A good camel is surprisingly smooth to ride; it’s almost as if you’re gliding over the terrain. The view from atop a camel is exceptional, you sit much higher off the ground than even the tallest of horse breeds. Perched on the peak of the camel’s hump, the rider’s line of sight is above the animal’s own head allowing for a completely unobstructed, 360 degree panorama of their surroundings. I’ve gained respect for the camel as a commercial stock animal, draft animal, a reliable mount, as well as a companion- they’re quite intelligent. Chiang Mai, Thailand, is located in the mountainous northern reaches of this beautiful country. The region is tropical with the mountains covered in dense natural rain forest. Logging was once a thriving industry here but conservation efforts have led to the timber industry being cut down instead of the trees. 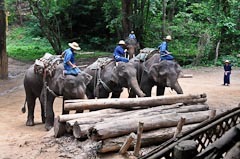 It’s an all or nothing policy that has also put an end to a much more environmentally friendly and sustainable method of logging in Thailand; traditional elephant logging. Unlike the African Elephant, the Asian Elephant is a domesticated animal and has been a working partner to mankind for thousands of years. In Thailand there is a long proud history of using elephant-power to work the forests. Now that the elephants and their Mahouts have been essentially put out of work, they rely on tourism to keep their traditions alive. It was here, in Chiang Mai, that I had my first opportunity to travel by elephant. In Thailand, there is a saying, “For each elephant there is only one Mahout and for each Mahout, there is only one elephant.” The lifespan of an elephant is about the same as the average human. The Mahout, or “elephant driver” begins his training as a young boy when he’s presented with his elephant. This method of training has a practical application as elephants think for themselves, they won’t listen to just anybody. The baby elephant and the boy grow up together, they live together, sleep together, eat together and work together for their entire lives. The incredibly close bond that develops over their lifetimes really has no equal here on planet earth. Getting on an elephant is easier than mounting a camel. For the Mahout, it’s simply a matter of letting his partner know he needs to mount up. The elephant holds out a front leg as the Mahout then gracefully steps up, grabs a hold of of the pachyderm’s ear, then the elephant lifts her leg a bit more, giving the Mahout a boost so he can slip gently into place just behind the elephant’s head. 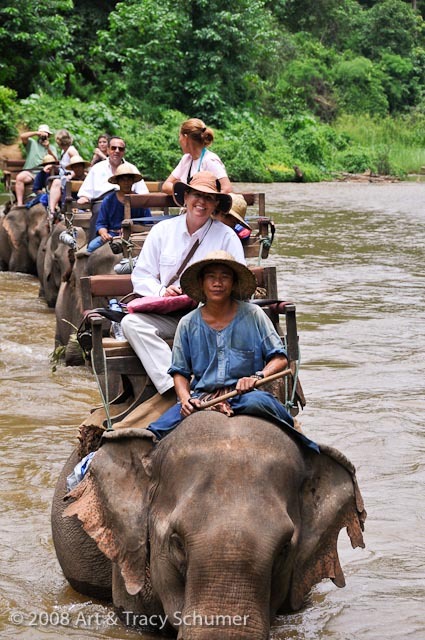 Elephant “saddles” are only for passengers, not true riders. The Mahouts ride barefoot as it’s with their feet, positioned behind each ear that they communicate most of their signals. For me, as a paid guest, it was merely a matter of stepping from an elevated platform onto a large bench seat that was securely strapped to the elephant’s back. It was a true tourist experience in many ways, but none the less fascinating. A two hour “trail ride” straight up a mountain followed. I felt like I was reliving a scene from the film; A Passage To India, all I was missing was my pith-helmut and an uncomfortable Edwardian era safari outfit. Thank goodness for microfiber, as it’s really hot and humid in Thailand. The boulder strewn trail wound through thick forest, the path itself was only a foot or so wide yet the elephants daintily strolled along; one carefully placed foot in front of the other. The elephant knew she was carrying me and she knew how wide her load was. At several points along the trail I could see that there would have been ample clearance for the elephant alone but she would step aside giving extra room for my awkward, wood-bench “saddle” to cleanly pass by a large tree or overhanging rock. Along with the sounds of the forest, the birds, the burbling streams, there was the singing. Some Mahouts like to sing to their elephants and this was quite magical. I enjoyed watching my Mahout as he gave subtle signals with his toes and soft voice commands that were little more than a whisper. The elephant moved through the forest silently, her giant soft feet hardly leaving foot prints. The highlight of the ride was the river crossing. 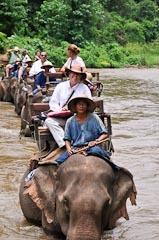 To see a dozen or so elephants all being ridden in a line across a large river was amazing. An elephant can be quite an elegant, genteel method of transport. I think everyone in our group was impressed by how pleasant the journey had been. So what possible practical application can these kinds of experiences have for the average horseman? Plenty actually, it gives us the opportunity to see beyond our own genre; not only beyond our individual disciplines but beyond the animal itself. Just as flexibility of the body is an aid to better horsemanship, flexibility of the mind is an even greater one. Seeing first hand how people from different cultures in other parts of the world work effectively with their animals, lets us know that their are many ways of approaching problems we ourselves may be having in our own backyards. Ultimately, riding a longhorn steer, a zebra, a camel or an elephant, may not directly improve horsemanship but it can improve the brain and that is an activity that’s always worth doing. Comments for "When You're Not Riding a Horse"
Donna Wald on September 02, 2010 I found this article to be very enlightening. I felt like I was the one riding the camel and the elephant! Great perspective and thought provoking article. Well done! Janet Deden on September 11, 2010 Fantastic piece! I, too, felt as if I were the riding these beasts. When the camel made that first lurch upwards, I nearly fell off my chair. (I’m quite sure had it been me, I would have rolled right off at that point.) Bravo to the author for staying put. Delightful reading.